The South Platte River runs by a utility plant near I-25 in Denver. Like many American cities, Denver grew up on the banks of its local river, the South Platte. In May 1858, in Cheyenne and Arapaho territory, a small party of settlers set off the Colorado Gold Rush when they turned up gold at the mouth of Little Dry Creek. The resulting trading and mining encampment, located at the confluence of the South Platte River and Cherry Creek, is now marked by the sprawling Confluence Park, nestled in the heart of Denver and offering a variety of recreation opportunities for city dwellers, including biking, kayaking, and fishing. The Platte’s headwaters emerge in the South Park highland meadow basin, then flow north and east through several major reservoirs. Just after entering the Chatfield Reservoir and State Park, it flows through the outlying cities of Littleton and Englewood before entering Denver city limits. By the time it reaches the Confluence at Denver’s heart, it has already picked up a number of pollutants from point and non-point sources, including stormwater runoff from nearby buildings. For the past 15 years, regular water quality testing at the Confluence and at other sites have revealed high levels of E coli bacteria, especially during the summer. Drought years—such as 2017, when the river was too low to support the normal popular tubing activities—exacerbate these problems, as nutrients and other pollutants build up and deplete oxygen levels. To add to these challenges, Denver is one of the fastest growing cities in America. Rapid development, trying to keep pace with the burgeoning population and industrial growth, has added to the burden of polluted stormwater runoff and put additional pressures on the low-income, underserved, and indigenous communities that already feel the brunt of local environmental and economic challenges. In total, the South Platte watershed drains 28,000 square miles on its way to the Missouri River; includes one million acres of public lands; is home to numerous threatened and endangered species; functions as the primary source of drinking water for the Front Range of Colorado (or about three quarters of Colorado’s residents); and is renowned for its “gold-medal” fishing. The South Platte River Urban Waters Partnership (SPRUWP) focuses on the headwaters and the Denver metropolitan area, and consists of over seventy organizations, including Federal and state government, municipalities, universities, NGOs and private businesses, all collaborating to address the problems facing the South Platte and improve this vital waterway for current and future generations — as well as those who live downstream of Denver. Below are two case studies highlighting some of the impacts of the Partnership. A previous Impact Story (2015) covered the genesis of Groundwork Denver’s water program at Bear Creek, which flows through several cities before it feeds into the South Platte at Englewood. Groundwork Denver leads water quality monitoring and community engagement efforts along Lower Bear Creek, primarily in the working class and low-income town of Sheridan, where many people play in or near the creek and bear the brunt of effects from pollutants that enter the creek upstream. Lower Bear Creek carries high quantities of E.coli, mostly from non-point sources. While E.coli is likely not the only contaminant present, it is an indicator of overall water health, and it is easy to train youth and community members in the process of testing and monitoring for this particular pathogen. In addition to water quality monitoring, Groundwork’s community engagement efforts include public education campaigns, trash cleanups, and canvassing area schools. Groundwork Denver maintains seventeen regular water quality testing sites in Bear Creek—with most sites located in Sheridan and Denver and one in Lakewood at the headwaters—in order to track how many contaminants the creek picks up on its way downstream. Through its Green and Blue Team job training program, Groundwork Denver trains and employs youths to conduct the sampling approximately two times per month in the winter and four times per month during hotter summer months. Professional and young scientists have discovered that the water quality degrades significantly on its way to Sheridan. 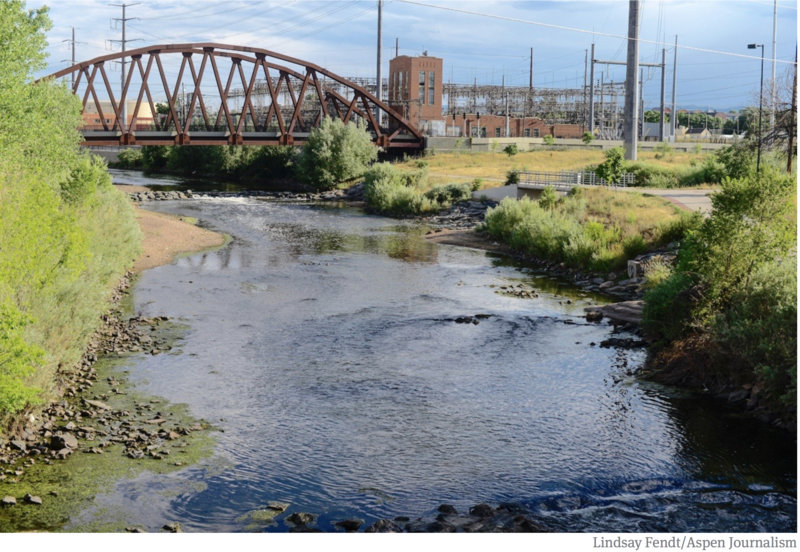 The purpose of the ongoing research is to create an overall picture of how the creek becomes contaminated and, more widely, to understand how the South Platte watershed is becoming contaminated and how best to address the problem. These data can serve to identify major outfall sources, inform targeted cleanup and prevention efforts, and drive public education campaigns to advise people about the safety of fishing and recreating in certain areas. In the future, Groundwork hopes to become involved in the development and maintenance of larger green infrastructure projects. Certification of Green Team members through Colorado State University will create opportunities for youth to lead future ventures in the area of green infrastructure design and maintenance. In 2018, Groundwork Denver—in partnership with Home Depot, River Network, Colorado State University, River Watch, area city governments, and more—received a National Fish and Wildlife Foundation (NFWF) Five Star and Urban Waters Grant to install green infrastructure on residential properties, organize volunteer projects to remove trash and invasive species from Bear Creek, and restore the Creek’s habitat by planting native species. In the words of Water Education Colorado (WEco)’s Executive Director Jayla Poppleton, “Our role as a collaborator [in the SPRUWP] is much the same as most of the other partners. We show up, we listen, we share our resources, we highlight opportunities we have coming up that others might want to take advantage of, and we try to be responsive to the needs identified by the group.” WEco programs include educational publications and radio broadcasts, webinars and workshops, leadership courses, an annual conference called Sustaining Colorado Watersheds, and for the past eight years, Urban Waters Bike Tours, which are open and free to the public and are put together collaboratively with a variety of other organizations including the Barr Lake and Milton Reservoir Watershed Association, the Colorado Stormwater Council, and the Metro Wastewater Reclamation District. Though WEco has a statewide mission and focus, the organization is based in Denver, with the bulk of programming taking place in the Denver metro area. To extend its reach, WEco hosts educational tours and workshops in rural and mountain communities and partners with other statewide organizations. WEco also offers extensive training courses and resources for water professionals, community leaders, educators, and non-water professionals. WEco estimates that it reached 156,377 people in 2018. As members of the Partnership, WEco has been able to build new connections, extend the reach of its programs, learn about additional funding opportunities, and secure additional funding for the Urban Waters Bike Tours through the Colorado Department of Public Health and Environment’s Water Quality Control Division. Going forward, WEco is committed to advancing awareness and understanding of water issues among a wider variety of citizens and decision makers. In 2019, WEco will be leading development of a Statewide Water Education Action Plan working with other water educators from around the state. The goal of the plan is to build a collective vision and set of goals and metrics that water educators can build on to achieve greater results. WEco is also dedicated to increasing focus on advancing public awareness, including a new initiative called Fresh Water News that provides weekly, up-to-the minute reporting on Colorado water issues, as well as more workshops on topics including community-level watershed health, water quality protection, and water conservation. In an effort to make water quality and environmental data more accessible to decision-makers and the general public, members of the Partnership—including Federal, state, local governments, and non-profits—have worked together to develop useful interactive tools that can be used in classrooms, community meetings, and more. In 2016, the Water Quality Working Group—chaired by Groundwork Denver—pooled resources to develop the Water Quality Assessment Tool (WQAT). The WQAT provides mobile-compatible online access to interactive maps, graphs and narratives users can bring into the field to explore water quality in the South Platte River basin. Educational tools include “storylines,” which are lesson modules covering E-coli, nutrient levels, dissolved solids, and more. Users can also map or graph contaminant levels at specific water quality testing sites, adjusting dates to look at discrete periods of time or analyze trends over a period of years. Instructors can easily use these tools to teach students how to read and analyze maps and graphs; scientists and advocates can use them to share the information with stakeholders in real time. This ecosystem services valuation tool provides interactive access to data about green infrastructure sites in the headwaters, Denver metro area, and the plains. Data are provided by forty public, private, and non-profit stakeholders. The project aims to equip decision-makers with the best available information about local natural capital—including city parks and forested regions—and their relative importance to public health and the economy. Ranks of importance were determined using forty-eight different studies combined with local data. Users can view maps of these assets by region or neighborhood. The methodology used to create the map combines approaches from multiple green infrastructure mapping efforts throughout the U.S., including Strategic Green Infrastructure Planning (Firehock, 2015) and ESRI’s Green Infrastructure for the U.S. Advanced users with their own GIS programs can download the data and view them in greater detail. Stakeholders interested in conducting additional, more detailed analysis can download the project data and use it within their own GIS interface. SPRUWP stakeholders have used the tool to rank and apply for funding for reforestation projects. Partners meet on a quarterly basis to highlight salient partner projects, research findings, and collaborative opportunities. Past highlights included the Denver Parks and Recreation river-front master planning process, Denver’s 2017 Green Roof Initiative (requiring all buildings greater than 25,000 square feet to dedicate a portion of their rooftop to green space), and efforts on the Upper South Platte to conduct landscape-scale forest resilience watershed restoration projects. 2019 presentations will include topics such as green infrastructure for urban stream restoration, automated stormwater sampling systems, and water quality analysis opportunities for students along the South Platte River. Sub-committees will meet on a more regular basis to focus on critical projects and tasks within the spheres of education/outreach and science/data related to the health of the river. The SPRUWP hopes to continue to facilitate the development of powerful partnerships that advance the vision of revitalizing Denver’s urban waters and the surrounding communities.